The brand-new Philadelphia Wings made their debut in Toronto on Friday night and holy crap, what an exciting game it was. If you weren’t there or didn’t watch it live, you’re gonna want to watch the replay right now. Go ahead, I’ll wait. The game was tied at one after one quarter and the Wings took a 3-2 lead into the half. It looked like we were in for a game similar to the Calgary / San Diego game from last week, which was tied at four after three quarters and ended 9-5. The offenses came alive a bit in the second half and the final score of 11-10 was a little low-scoring but not that unusual. But how we got to that 11-10 score was a ton of fun. Would I, as a Rock fan, have used the word “fun” if the Wings had scored in OT rather than the Rock? I probably would. You always hear that to be successful, your best players have to be your best players. It sounds redundant but it’s true and on this night, Tom Schreiber and Adam Jones were the Rock’s best players. They scored five goals each, with Schreiber scoring three game-tying goals and Jones scoring a tie-breaking goal and the OT winner. The phrase “Money Baller” comes to mind. 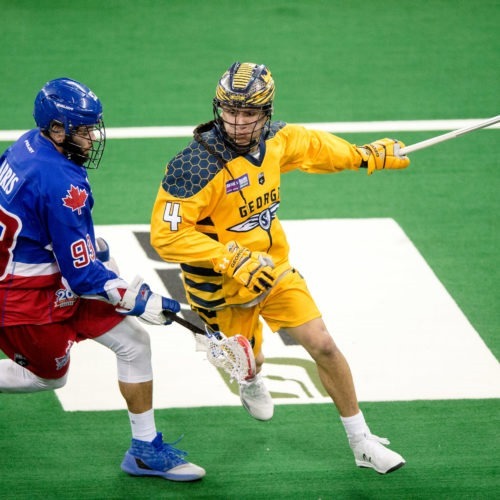 Unfortunately for the Rock, that was all the scoring the entire team could muster other than a transition goal from Brandon Slade in the second quarter. Eleven goals was enough to win this one but in general, having only three players score goals is not a recipe for victory. The Rock offense really struggled at times, with passes clearing their intended target by a couple of feet and shots missing the net by just as much. The score sheet said the Rock had 62 shots on goal and 22 shots off, but I’m not sure I buy it; 22 seems low. There were a lot of shots from distance and nobody wanted to get in close. But the most frustrating part was the offensive turnovers; I lost count of how many times a Wings defender knocked the ball out of a Rock player’s stick, grabbed it, and ran. They had at least three breakaway goals after such turnovers, and seven of their ten goals were from transition. Philly’s offense was a little more balanced than the Rock’s; they had six goal scorers, with nobody scoring more than two. Brett Hickey didn’t score any but Blaze Riorden had a couple, and both times I thought it was Hickey. Chris Cloutier isn’t a huge guy (6’1″) but is solid (227 lbs) and showed why he was a top draft pick. The Wings struggled on offense as well but I thought that was a little more due to a strong Rock defense than problems with the forwards. A lot of people are big on Frank Brown and I saw why: he was all over the floor and played some smart defense. 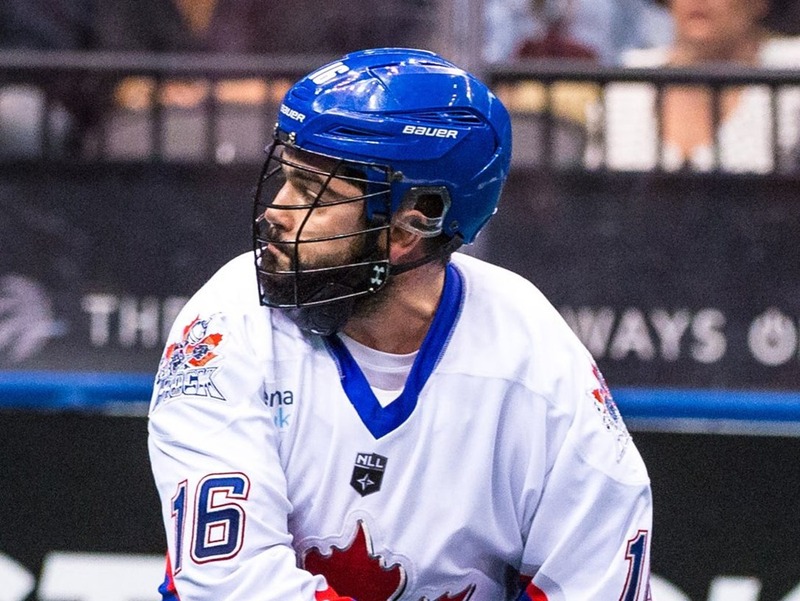 Joakim Miller played his first game, becoming the first Finnish-born player in the NLL. Brad Kri played another excellent game on D for the Rock, which is starting to become commonplace. Latrell Harris entered the league as an eighteen-year-old but rather than becoming the flashy transition guy I thought he would, he’s turned into quite the strong defender in his third season. You know he can score if he gets the opportunity but he’s happy to stay in his own end, without the fanfare, and quietly get the job done. Nick Rose had a good game, making a few really good stops but he also allowed a few he probably shouldn’t have, and he does tend to give up a lot of rebounds. One long shot from Kiel Matisz beat Rose and nobody was more surprised than Matisz. In general though, Rose gets himself set up very well, so he doesn’t always have to move much to make a save. I think a lot of the saves he made on Friday night were like that: they didn’t look difficult because he was in the right place. He didn’t have to make a ton of acrobatic saves, and you get fooled into thinking he wasn’t that great. I did say that the Rock’s offense struggled, but I don’t want to take anything away from Doug Buchan’s performance. He was outstanding. Similar to Rose, he didn’t make a lot of diving or “Oh my god how did he stop that” sort of saves, but he was always in the right position, cutting down angles and making it difficult for Rock shooters. I think both the Wings and Seals will be better this year than previous expansion teams in their first seasons, and if Buchan can play like he did in this game, Philly can compete with anyone. Phil Caputo was a healthy scratch, just like last week. I hope Caputo doesn’t become this year’s Dan Lintner, who was scratched in what seemed like half the Rock’s games last season. Damon Edwards got a holding penalty against a Wings forward who had what looked to me to be a clear breakaway. Not sure why there wasn’t a penalty shot there. On another play, Steph Charbonneau got a breakaway and Challen Rogers didn’t leave the bench to stop him until a forward made it back, and by that time it was too late to prevent the goal. It was only 6-5 or so at the time so my question to you: in the third quarter of such a low-scoring game, do you send the defender out early to prevent the goal, knowing you’ll be taking a Too Many Men penalty? I might have. 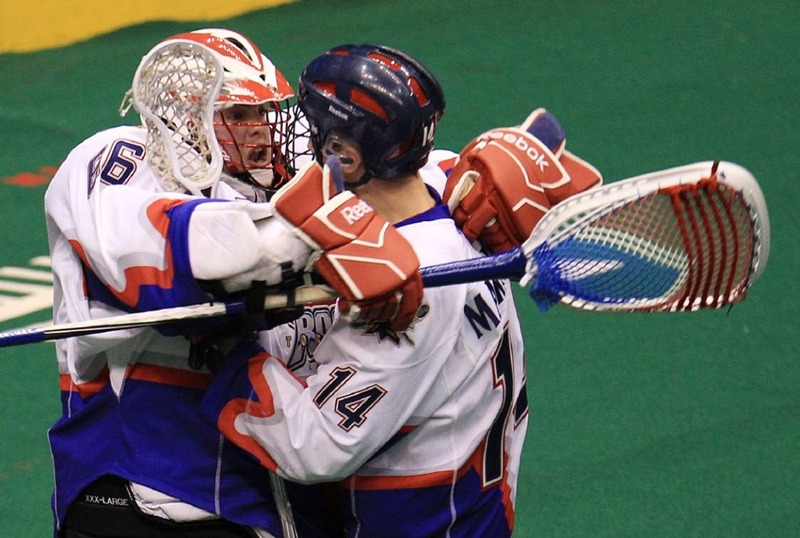 In the fourth quarter, Rob Hellyer thought he had tied it up but the goal was waved off. Matt Sawyer threw the challenge flag (see next game note) and during the review, a number of replays were shown that clearly showed that the ball never crossed the line. There was no question that the goal shouldn’t count. Regardless, when the ref signalled “no goal” after the review, fans booed and a few yelled the typical “refs are blind”-type comments. I don’t get it. It was clearly not a goal, so why give the ref grief about making the right call? I was under the impression that all goals (and close calls) were reviewed in the final two minutes of the game, and throwing the challenge flags was not only unnecessary but not allowed. This was not quite correct: all goals are reviewed in the last two minutes, but non-goal call are not unless the challenge flag is thrown. This was explained on Twitter by Rob Buchan, who is the GM of the Langley Thunder, a Bandits scout, and (I believe) father of Wings goalie Doug Buchan Update: they are not related. Thanks to Brad MacArthur for the update. On last week’s game report, Kurt Cinney left the following comment: “spoiler alert perhaps?” It didn’t occur to me that people may not have watched the game, and the title of my article (which contained the final score) gave away the ending. I’ll now leave the score out of the title and try to be clever about the first couple of lines of the first paragraph, which get displayed on Facebook. Thanks for the suggestion Kurt!